Yes, it is a new beginning. It is time for me to move forward and celebrate this new life. While I am pleased with where I am with my life right now, I do still know I have much to learn and experience on my journey. As I move forward with a new beginning, I need to stay mindful of where I am heading at this stage in my life. If the average human life span was 50 years, how would you live your life differently? At what time in the recent past have you felt most passionate and alive? If I answer these questions as I would one, two, and three years ago and compare it to today, the answers change with each passing year. What I see is growth in me. A happier me. I know I am moving on the right path and where I am headed is becoming more clear. While I had a significant change in my life on Wednesday that has led me to a point of a new beginning, we all have an opportunity for a new beginning. Each day is a chance to start anew. Go create the world you want. I agree with you those questions would have much different answers pre vs post divorce. My ex husband could never understand how I could rise anew each morning and be ready to tackle whatever I had on my plate, regardless of any drama, issue or unresolved crisis from the day before. I still feel like every day is a new day, waiting to be created, but had lost the gratitude for the idea (and the power of that mantra) until I read this post. I am so happy this post reminded you to start each day with the thought it is an opportunity to start anew. It makes me happy when I read something I wrote helped a reader; it’s the best part of blogging. I love that song. I also love, “Go create the world you want”. It just seems so inspiring, you know? I agree with you Suz. It’s an inspirational line. Congratulations on your new beginnings. I am still pondering those questions, particularly the one about the life span being 50. What would I do differently heading toward the end? I enjoyed those questions as well. I am 74 yrs old and if I have learned anything it is that one shouldn’t waste your precious time in life kicking a dead horse. OK, maybe not profound but if something is not working, try something (or someone) else. Good luck my friend. Thank you for visiting and thank you for reminding me that there are times it is just necessary to move on. You are so right. I love this, and those questions are incredible. Wow! I’ve been through a divorce and now a big job loss that opened new doors. I feel your struggle, but share your enthusiasm for the next new beginning. Beautiful stuff is coming for you!! Thank you Heligirl! I feel great where I am in life at this moment. I feel only good things are coming my way lately and I am reveling in it. It was a long, sad struggle to find the happiness I have right now. Best of luck to you as you start a new beginning as well! Good luck to you on your new beginnings. Life is too short to spend it being unhappy. Rebel Chick Jenn recently posted..I quit smoking…again. Also? Aetna is the best insurance ever. I finally realized life is too short to be unhappy, which brought about great change in my life. Hence the I am Not a Tree post! Thanks for visiting and commenting. Ahhh… the 50 questions that free your mind! I know these questions well as I am answering them, one by one, on my blog as part of my Day Zero Project. These are hard and thought-provoking questions, but they are really a good way for one to dig deep and think. Though life may be short to a point, it’s a long road. And it can be a fun road. 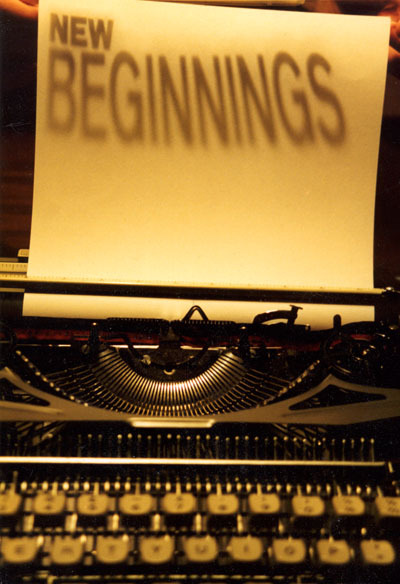 New beginnings can happen at any time. Excellent post. And good luck in the road you go and in all you do! I checked out your Day Zero Project. What a great idea to include on your blog. I believe instead of being upset about an ending, one should focus on the beginning that comes as a result.